It was this first impression that solidified Feisal’s admiration for the teaching staff here at LSBU. He went along to an event where the academic staff had a stand, and in particular Dr John Seeley, Katya Mileva and Dave Cook all impressed Feisal and consequently convinced him to further his studies here at LSBU. Feisal was also impressed by the facilities at LSBU, where we have a sport and exercise Science Research Centre, with sophisticated and leading equipment, along with an Academy of Sport, which has a SMART Centre Technology, a Functional Training Zone, Free Weights Room and Sports Hall. The Sports Science labs in the K2 building have also been very beneficial and helped Feisal develop a greater understanding of physiological, biomechanical and psychological effects and changes to individuals’ experience. Feisal wasn’t disappointed after his initial first impression of the staff here at LSBU. His final year project involved investigating brain and muscle oxygenation to discover whether brain and muscle oxygenation can be predictors for both mental and physical fatigue. He was lucky enough to have a huge sample size, so this allowed him to test multiple individuals, monitoring their optimal performance and the changes in oxygenation throughout the brain and muscles. Football is a sport of personal interest, so combining both studies and hobbies was something Feisal really enjoyed. “During my degree, I was faced with a number of challenges. The biggest challenge however, has to be my final year research project as I was required to be in the University really early and leave very late whilst I was running the experiment. In addition, the data collected had to be smoothed. With a large sample size, and various components of data, extracting correct data was very difficult. "The chosen title for my final year project was ‘Near-Infrared Spectroscopy (NIRS): Brain Oxygenation as a Measure of Mental and Physical Fatigue during Dual Tasking’. The objectives were to investigate brain and muscle oxygenation to discover whether if they (brain and muscle oxygenation) can be predictors for both mental and physical fatigue. Data collection comprised of performance, physical and psychological effects, which was measured by applying NIRS interoptode probes on the forehead and the thigh. Participants were also asked to perform the Go/No-Go test (MT), which focused on correct counts answers and reaction time. The findings suggest that participants required a lot more time to make the correct decision in the dual task in comparison to the single task. More so, decision making was further delayed when individuals were fatigued. Feisal was previously a football coach in north London and played competitive football at a semi-professional club in Enfield. He continued to play football socially throughout his time at university. Making friends and meeting like-minded people on the course was just another benefit that Feisal enjoyed from his time at LSBU, along with developing his knowledge in Sports Science. 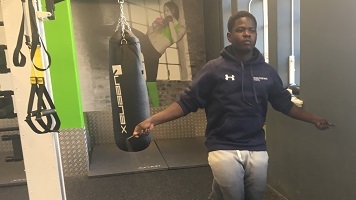 Even though Feisal found the course challenging and tough at times, it has motivated and pushed him to further studies, where he’s looking to do a masters in either physiotherapy or chronic cognitive psychology.